A presentation by students of the MIT Department of Urban Studies and Planning has suggested more green space and pedestrian-friendlier streets and business districts as the City looks towards incorporating the Green Line in the Winter Hill and Magoun Square areas. The presentation was broken up into parts that included research findings, business inclusion updates and preliminary proposals that will be modified to include suggestions from attendees at last night's meeting. The students have been studying these two areas since the week after Labor Day, compiling data and researching areas that warranted special attention. Magoun Square was noted as one of these areas as it has 7 vacant storefronts and a parking supply and demand mismatch. My overall summary of the presentation and following discussion is that concerns surrounding the physical appearance, traffic, and zoning that have been brought up by advocates and business owners were confirmed in the MIT presentation last night. The only piece that, I felt, was not deeply researched was the mentioned demand and supply mismatch between parking spots and businesses. The students stressed the need for an openness to different modes of transportation including walkers, cyclers, and public transportation users. 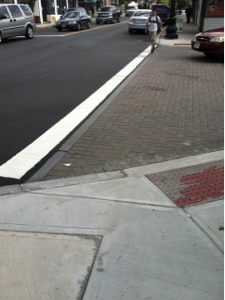 One advantage that Magoun has over the Winter Hill area is the streetscape improvement project that updated the streets, lighting and sidewalks of the square. Brick paved crosswalks (Picture B. Although proven to be unfriendly to members of the disAbled community) were complimented as safe ways to navigate from one side to the other, as well as, traffic calming measures. This leads, according to the students, to a pedestrian-friendlier business district that will make patrons feel safe and ensure equal business opportunity for both sides of a district. 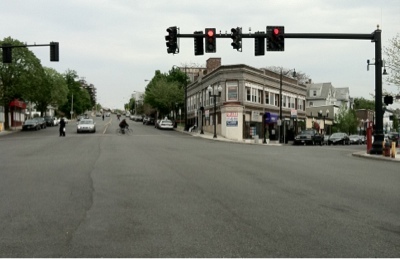 Similarly to Winter Hill, the intersection of Medford Street and Broadway makes patrons of one side feel separated from the other (Picture A). Broadway by the former Star Market across to Leone's was used as a comparison. Recommendations including bring Broadway down to one lane and including wider sidewalks going up the main thoroughfare, including trees or other green space would make the area seem more inviting to patrons and more alluring to businesses. The angled parking system was mentioned as a way to bring Broadway down to one lane-complimenting the recent news that Somerville's Traffic and Parking Department will be piloting the system at Trum Field this winter. One of the most interesting recommendations made encourages height increases for buildings in Magoun Square that would include retail on the bottom and residential or office space at the top. This is currently the case in some parts of Winter Hill and the students felt that having more space would assist property owners in the renting of their space with motivated businesses that could fill out the square footage and pay higher rates. Ward 5 Alderman Sean O'Donovan voiced his support of this concept at the meeting. Magoun was also the subject of some very artsy suggestions as both the Privitera building (seen in Picture A), as well as, the old Cara Donna location were photoshopped to feature art on the outside of the buildings to encourage artists to fill in vacant storefronts in the square and add an artistic element that would promote foot traffic and visibility from cyclists and motorists. After the presentation, attendees were invited to voice thoughts and suggestions as to how the research can be directed to produce more precise recommendations. Traffic decreasing and calming measures were highly supported by both Aldermen and residents alike as was increased engagement with property owners. Being the most unpopular opinion regarding the likelihood of the Green Line coming to Magoun Square, I asked the students to remove that piece out of the equation when it came time to making recommendations as I would like to see what can be immediately implemented. Believe it or not, I was the sole voice in the skepticism of the Green Line possibility. A follow-up meeting has been tentatively scheduled for December 6th where the students will unveil their final presentation and recommendations. As I pointed out above, I will link to the presentation as soon as it becomes available and will broadcast it on the Magoun Square United listserv, as well. I thought you did well including Winter Hill in the summary. Good job! "One of the most interesting recommendations made encourages height increases for buildings in Magoun Square that would include retail on the bottom and residential or office space at the top. " While I would not have a problem with the increase in height, I connot see how to get the parking to make it worth while. A company will rarely rent a space that doesn't include employee parking. This was one of those recommendations that was made for the Square in conjunction with the Green Line Extension arrival, as well as, parking increases from angled parking systems by Trum Field and along Broadway. Given Magoun's current parking availability...this is absolutely not an option! Thanks very much for the summary write-up, Courtney.